FILE - Unemployed protesters demonstrate in Tunis, Tunisia, Jan. 22, 2016. Seven years after the Arab Spring, little has been done to address youth unemployment in Tunisia, rights groups and experts say. Seven years after the Arab Spring, little has been done to address youth unemployment in Tunisia, a key factor in extremist groups' ability to recruit marginalized youth, rights groups and experts warn. "Someone who is marginalized with nothing to lose, no stability in life, no vision of the future, no hope for change, can become a very easy target for terrorist groups," Amna Guellali, director of Human Rights Watch's Tunisia office, told VOA. 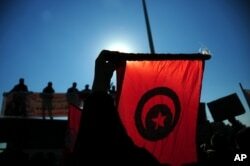 The Arab Spring was ignited in Tunisia, in part because of deteriorating economic conditions. A frustrated street vendor set himself on fire outside a local municipal office in Sidi Bouzid to protest repeated harassment from authorities, who often confiscated his goods or fined him for selling without a permit. Although economic conditions that force people to eke out a living on society's margins play a big role in the unrest, Guellali said that unemployment is the central issue in Tunisia. "Unemployment stands at 15 percent, rising to 36 percent for Tunisians under 24 years old. Unemployed youths with diplomas are 25 percent, according to the last statistic of 2017," Guellali added. FILE - Tunisian police officers wave the national flag and posters as they demonstrate outside the presidential palace in Carthage near Tunis, Tunisia, to demand a pay increase, Jan. 25, 2016. The World Bank, which has been helping Tunisia in its development, has also warned that unemployment among young people is a serious issue that needs to be addressed. The World Bank says Tunisia has made progress in its transition to democracy and good governance practices, compared with other countries in the Middle East, but still grapples with growing its economy and providing economic opportunities. Tunisia's economic growth in the post-Arab Spring era remains weak despite a modest increase in 2017. According to World Bank data, the economy grew by 1.9 percent in 2017 compared with 1.0 percent in 2016. Since the revolution, the economy has been growing by an average 1.5 percent annually, lower than previous years. "Tunisian youth don't see improvement; they actually see that the economic conditions have worsened more than the previous regime," Darine El Hage, a regional program manager at the United States Institute of Peace (USIP), told VOA. FILE - Protesters face police in Ennour, near Kasserine, Tunisia, Jan. 20, 2016. 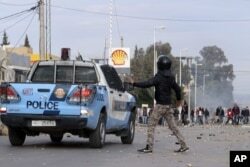 Tunisia declared a curfew in the western city at that time after clashes occurred between police and more than 1,000 young protesters demonstrating for jobs. El Hage added that the institute's field research indicates that Tunisian youth are both frustrated and feel hopeless, with some appreciating the previous government of Zine al-Abidine Ben Ali for its relative stability. Mohamed Malouche, founder of the Tunisian American Young Professionals organization, agrees. He believes that ordinary Tunisians feel betrayed by the country's politicians. "The Tunisian public has been very patient, but they are not seeing that democracy is paying off. They all feel that they have been cheated by politicians," Malouche said. Terror groups such as the Islamic State group and al-Qaida have large numbers of Tunisians among their ranks and are active in various countries in the region. Youssef Cherif, an independent Tunisian analyst, believes that when young people join militant groups, it is not due to ideological or religious preferences. "Tunisian youth are trying to find a space where they can feel that they are important and feel a sense of identity and sense of belonging," Cherif said. 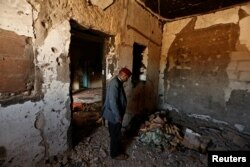 FILE - Hamid Ishi stands in his house, which was taken over by Islamic State jihadists and damaged during fighting with government forces, in Ben Guerdane, Tunisia, April 10, 2016. Malouche agrees. "The lack of economic opportunities, the feeling of injustice and the lack of trust in the government institutions force Tunisian youth to take the extremism route," he said. "Tunisia is becoming a fertile ground to extremism recruiters who are taking advantage of vulnerable young men by offering them money and promises," he added. Malouche said lack of political representation is also a factor. "The Tunisian youth are not [seeing] themselves in the political process. They don't feel that they are truly represented by the current people in power," he said. Since the toppling of autocrat Ben Ali in 2011, nine Cabinets have been elected, none of which fully addressed high inflation and unemployment. "The government has not addressed the root causes of the situation. They haven't adopted comprehensive policies. They only adopted some cosmetic measures," Human Rights Watch's Guellali said. The government is trying to encourage foreign investment, but continued instability has deterred investors, she said. Political differences between President Beji Caid Essebsi and Prime Minister Youssef Chahed further complicate efforts to bring about reforms. In July, Essebsi urged the prime minister to step down, citing the country's political and economic problems. Chahed ignored the call. "A change of government will shake the confidence of Tunisia's international partners ... as economic data will begin to improve by the end of this year ," Chahed told state news agency TAP, responding to the president's call for his resignation. FILE - An outside view of the international conference center in Tunis, Tunisia, where investors converged to attend an international investment conference called "Tunisia 2020" as the government tried to drum up billions of dollars to keep its young democracy from falling into economic collapse, Nov. 30, 2016. The Tunisian government has taken a number of steps to try to address inflation and unemployment, including efforts to strengthen small businesses in the country and exemption of foreign companies from taxation to encourage more foreign investment. But analysts, like USIP's El Hage, believe that these solutions are at best easy fixes. "There are some mobilizations at the level of the government. However, these mobilizations are short-lived and don't reflect long-term and comprehensive economic reform policy," El Hage said. Some of the information in this report came from Reuters.